Composed by Jamey Aebersold. Play-Along series with accompaniment CD. Jamey Aebersold Play-A-Long series. Book & 2 CDs. Published by Jamey Aebersold Jazz (JA.V107DS). Intermediate/Advanced. 24 beautiful, well-known standards in keys comfortable for most female singers. The first class rhythm section plays each song with special sensitivity and with the singer in mind, includes intros that help orient the singer to the first melody note. Special stereo separation allows piano playing vocalists to eliminate the piano track and play/sing along with just bass and drums. Book includes lyrics written over the melody notes, piano cues, and chord changes. RHYTHM SECTION IS: Steve Allee, Piano; Tyrone Wheeler, Bass; Jonathan Higgins, Drums. There's no piano part written out here. The product description says the book "includes" lyrics, melody notes, piano cues and chord changes; "consists of" would have been more accurate. 12, matching the CD tracks..instead of 13 to 24. 40 of 71 people found this review helpful. 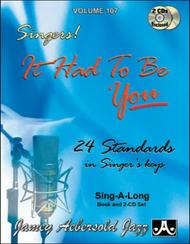 October 28, 2007 "It Had to be You" is great for jazz singers! I really love the variety of music in this songbook and the accompaniment tracks are wonderful! It is so much easier to practice jazz with the tracks than with only the piano music. 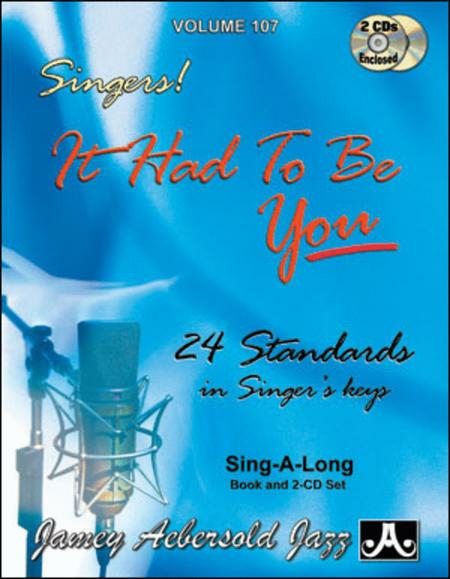 If you want to practice and learn vocal jazz, this book is a great help. 33 of 69 people found this review helpful. March 23, 2007 Great for violin, too. In addition to singers, this is a great book for violin. The keys are good and if there is an occasional low note the violin does not have, it is an opportunity for improvisation!